For a change I've decided that I'd like to try a new style of crochet... filet crochet. In its most easy form this uses just two crochet stitches to build up a grid of empty or filled-in squares, allowing you to make a blocky pattern. Using smaller yarn than normal, mostly called cotton, allows you to make the blockiness less obvious. I decided to do some example items just to see how large they will work up. Here's the biggest cotton I could find. It needs a 2.5mm crochet hook to work it - which is one I happened to have already. You can see the difference in hook sizes and yarn/cotton in this picture. I also had fun doing searches on Pinterest to find a pattern that I thought would give me a good idea of gauge. Most of these don't look like normal crochet patterns. Instead they look like graphs/grids. Since filet crochet only uses two stitches the pattern can be simplified a bit. The two stitches are a treble and a chain (or in the US you'd do a double and a chain). Three or four stitches make a square of the pattern. That sounds a bit odd, but each square of the pattern is made up of four stitches, but the last stitch of the previous square will become the first stitch of the next square. 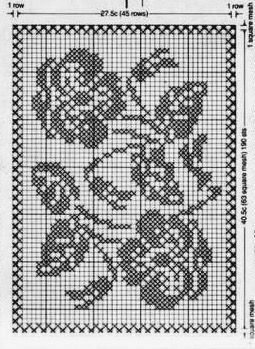 A blank square is made up of the last previous stitch - always a treble (UK) or double (US), plus two chains and a final treble (UK) or double (US). The filled-in square is made up of the last stitch (again always a treble/double) and the three stitches that follow are also trebles/doubles. I find the switching of terminology so confusing - and it's tons easier for me to read charts, so here's a chart I've drawn on a post-it note that shows each stitch. Hopefully that will help you visualise how this would work. Then I had some fun looking for patterns on Pinterest. There's some gorgeous patterns, but some look a little bit too ambitious for a first attempt. You'll also see that there's some exception to the rule of only two stitches being used. But for my first attempt I wanted something square or rectangular, with just the two stitches. I found a lovely rectangular pattern of pansies, with no information about it other than a link to the image itself. Sadly the image isn't really very large. So I copied it out by hand to some graph paper. If you don't have any you can find square paper templates on the internet. You can see there's some notation to indicate how many rows and stitches are involved. I've actually started stitching this from the top of the image you can see: so the 47 rows are actually 47 squares, totaling 141 chains (plus 3 for the first stitch of the next row) as a foundation chain. I had no idea what size I'd get - that was pretty much the reason I was trying a sample. As you can see this looks like it's going to be bigger than the two A4 pages that I copied the template onto. It's working up much quicker than I expected. I've managed this over the weekend while binge-watching Netflix! That means I'm a little more than halfway through! The only thing I'd do differently now is that I'd work from the bottom of the chart up: it mimics the way I hold the crochet as I make it, so it would make referring to the pattern a bit easier. Hopefully I'll be finished this month: at which point I'll post part 2 of this blog post. Follow the filet chart from the bottom up!